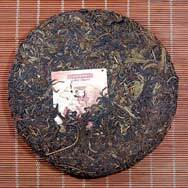 This is the raw Pu'er version of Yi Bang Cha Ma Si Tea Industry's Fo Cha (Buddha Tea) Pin Xi Lie Series of Tea Cakes. 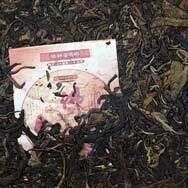 What is special about Yi Bang Cha Ma Si's product is that each of its tea cake wrappers was designed by a famous painter. 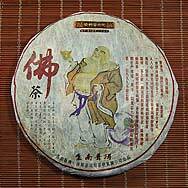 In this tea cake, the wrapper shows a picture of Buddha, representing the tie and connection between Buddhism and tea culture in China.